Hardin, Nov. 7. 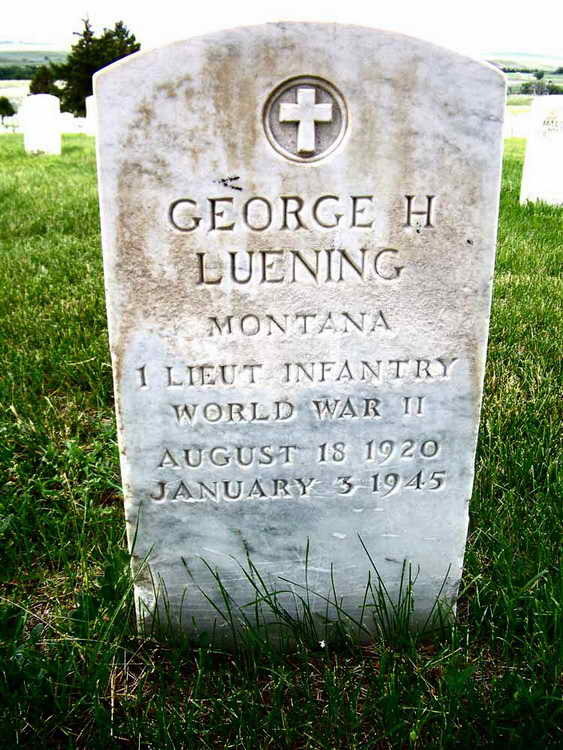 - The bodies of Technician Fifth Grade Thomas J. Louk, son of Mr. And Mrs. Stephen P. Louk of Crow Agency, and First Lieutenant George H. Luening, son of Mrs. Edgar L. McCullough of St. Xavier, will arrive in Hardin next week and will be buried in Custer Battlefield National cemetery with military honors. Both men were killed while serving with the army in the European theater of operations during World war II. Four other men killed in the war will be buried in the cemetery next week. They are Staff Sergeant Waldon R. Hardy, son of Ruger F. Hardy of Chelan, Wash.; Private First Class Gilberg Engen, son of Mrs. Dorothy S. Engen of Fairview; Private First Class Edwin I. Nordman, son of Mrs. Clara V. Albone of Great Falls, and Private William K. Haslam, son of Frederick I. Haslam of Silverdale, Wash.
Interment Record and grave marker for 1/Lt George H. Luening at Section D Site 5 of the Custer National Cemetery, Crow Agency (Big Horn county) Montana. Lt Luening was a member of Hq 1st before being transferred to 542nd PIR on 30 August 1943. He was later transferred to Co A of 551st PIR and was killed in action on 3 January 1945 in Belgium. He was posthumously awarded the Purple Heart. 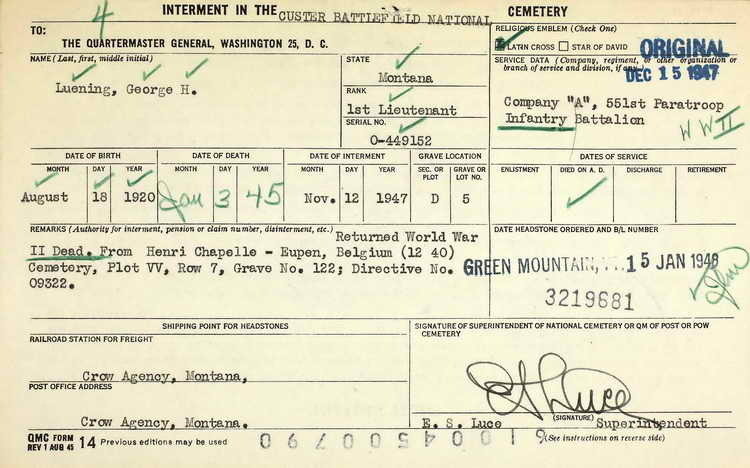 Ly Luening was initially interred in Henri Chapelle, Plot VV, Row 7, Grave 122 until his remains were repatriated and reinterred in the Custer National Cemetery on 12 November 1947.